Cora Cooks: And The Winner Is . . .
. . . Laura McCrae from Not So Urban Hennery! 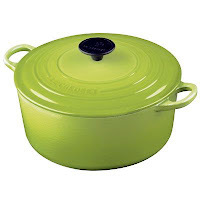 Congratulations to Laura, who will be receiving her lovely new Lemongrass Le Creuset 5 1/2 qt. Dutch Oven directly from Williams-Sonoma in just a few days. Thanks to all the participants, Menu for Hope V raised over $62,000 this year. And a big thanks to Pim for organizing this event. I am honored to have been a donor and grateful to all my readers who were so supportive. If you haven't yet, you can see the whole list of winners at Chez Pim. I didn't win those great photography lights from Kalyn, but I'll be back next year to try again. See you there! The pot arrived today and I cannot tell you just how delighted I am. Thank you! Laura, you are most welcome! I am so glad Pim's Menu for Hope brought us together in such a wonderful way. And congratulations on being a finalist for Best Food Blog-Rural too! May your good fortune continue to multiply. Cora, I love your blog and have shared an award with you. Check it out when you get a chance. find more CC recipes here! All original photos and text are the property of CoraCooks.com © Copyright 2007 - 2018. Powered by Blogger.